The Ram 1500 is known for its best-in-class comfort. Inside, you'll find high-quality materials and tight construction - no squeaks or rattles here, even when the ride gets rocky. Depending on trim model, you can add rich leather upholstery and ventilated front seats for maximum luxury on the job. Like the Ram, the 2018 Ford F-150 offers a range of trim models - from the work-truck-friendly XL to the plush top-trim Limited. The mid-range XLT is big on modern comforts, with an eight-way power-adjustable driver seat to help you find the perfect spot behind the wheel. Things get increasingly luxurious with the Lariat and up, where you'll find leather upholstery and cozy seat heaters. If you're looking for the most in utility, the F-150 is your truck. Depending on configuration, the 2018 model tows up to 12,100 pounds. That means you can haul construction machinery around during the week and your family boat on weekends. With the regular cabin and the 5.0-liter V8 engine, your F-150 can haul max loads of 3,270 pounds. Whether you're hauling bricks and mortar or your lawn-mowing business, this truck has you covered. Depending on configuration, the 2018 Ram 1500 can tow max loads of 10,620 pounds. That's not quite as much as the F-150, but it will still move a huge family boat or camper. 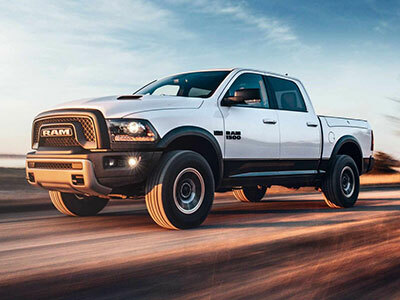 The Ram 1500 moves max payloads of 1,880 pounds, so it may take a little bit longer to transport construction materials from worksite to worksite. 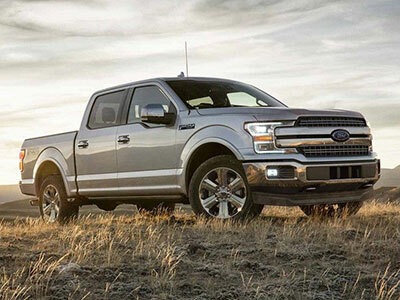 In rugged territory, the F-150 excels. You can add four-wheel drive to any model, no matter the trim or cabin-bed configuration. If you've got some serious boulders to tackle, the off-road-ready Raptor model is especially attractive. It comes with a special high-output version of the turbocharged 3.5-liter V6 engine, making 450 horsepower and 510 pound-feet of torque to get you through sand, snow, mud, or mountain. The Ram 1500 also offers a specialty off-road trim, the Rebel. Like Ford's Raptor, the Rebel comes standard with hardware like all-terrain tires and Bilstein shock absorbers to help you tackle difficult territory. Under the hood, its V8 engine doesn't generate quite as much power, with only 395 horses and 410 pound-feet of torque. Ford's new Pro Trailer Backup Assist system gives the F-150 the lead in this department. You can control trailer direction via a dial on the dash, so you don't have to worry about jackknifing. This truck also offers a number of cameras - including a camera that helps you hitch a trailer, a camera that helps you keep an eye on your truck bed cargo, and a 360-degree bird's-eye-view camera that offers a top-down look at the truck as you pull into a parking spot. Like the F-150, the 2018 Ram 1500 offers a 110-volt, household-style power outlet, so you can charge work-related tools, like laptops and power tools, from anywhere. The Ram doesn't have a trailer assist system, but all models come with a backup camera, so you can spot any bikes or skateboards strewn in your path - before you run them over. At the end of the day, the 2018 Ford F-150 has the modern edge. Exclusive utility features help you tackle big jobs with ease. This full-size truck's off-road performance is second to none, especially when you select the off-road-ready Raptor. We're also fans of this truck's substantial towing and hauling capabilities, which make it the right pick for drivers who move heavy loads on a regular basis.